A wise friend recently said to me while walking around Lady Bird Lake, “Music is the reverberation of life.” According to the Collins Thesaurus of the English Language, some synonyms of “reverberation” include: “echo, ringing, resonance, resounding, vibration, reechoing (the echo of an echo).” The word that intrigued me the most was “reechoing” because it implies a circle of life that continues to affect us no matter what stage of life we are in. In terms of music, it has the power to affect us daily, resounding and echoing through our core to positively affect our lives. 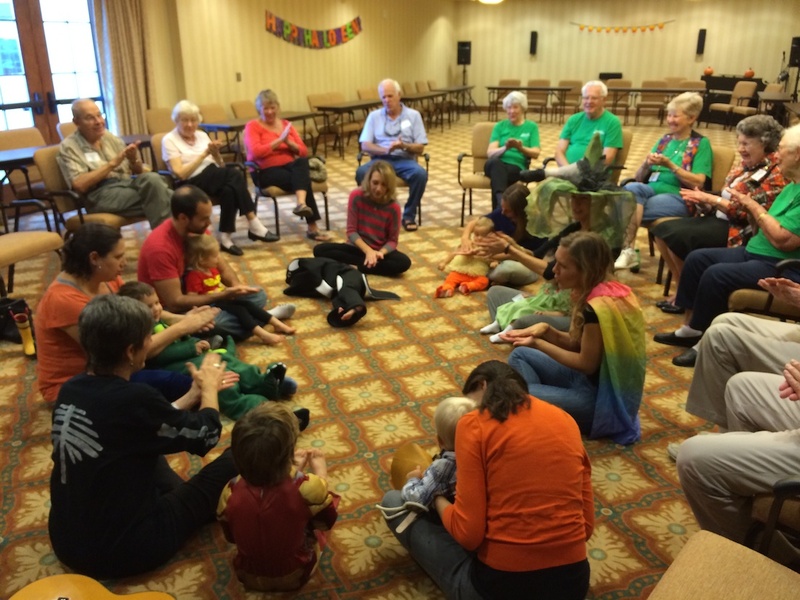 I witness this phenomenon every Thursday morning at my Intergenerational Music Together class at Buckner Villas. I see it in my friend Roland who, a few weeks ago, asked permission to bring his string bass to class and play with us. He encouraged the children to strum the strings so they could experience how differently bass strings feel compared to my guitar strings. Roland told me a story of his grandson who, when four years old, wanted to strum the strings just like his grandfather, but the boy’s mother was afraid for him to do that for fear he might hurt the strings if he pulled on them or strummed too hard. 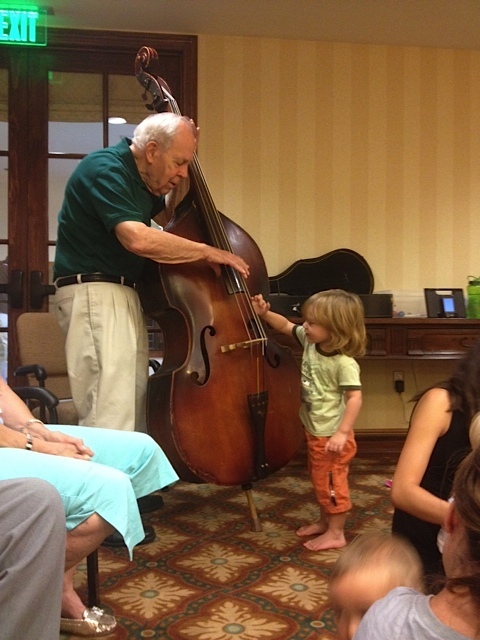 Grandpa Roland of course wanted him to play the bass strings and remembers thinking, “One never knows how we affect children’s lives because we never really know what is going on in their heads!” This same grandson just completed his degree in music at Baylor! Roland and his wife, Elizabeth, have five children and they are all musical. One of their sons is the music administrator for the Alamo Heights School District in San Antonio. Their daughter majored in voice and taught music in the public schools for many years. Every Christmas, they get together with all of their instruments and put on a musical variety show. Their love of music is reverberating through the generations of their family and I am certain their grandchildren will continue to pass on this love of music. I see this process of reechoing in my friend Phyllis who knows the name of every child who comes to our Intergenerational class and wants to hug and hold each one of them every week. She jumps right in and leads a rhythm pattern whenever asked. 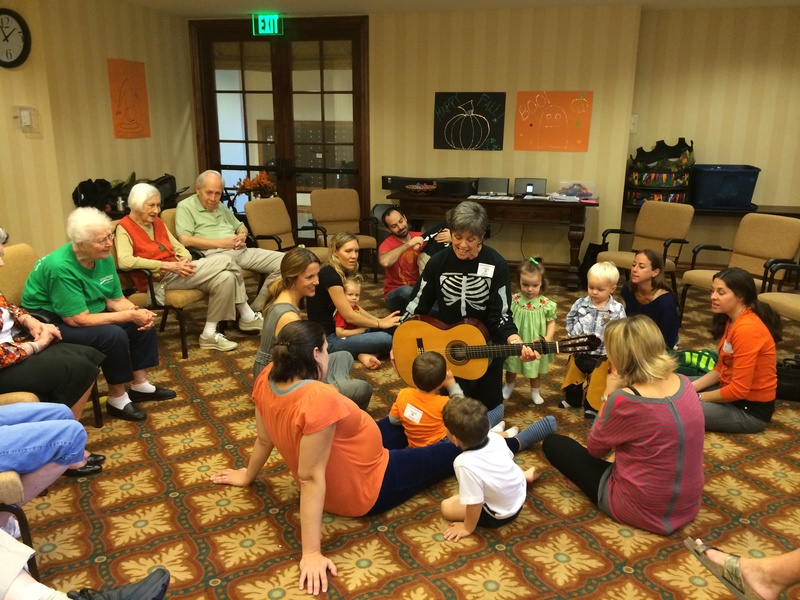 She feels so strongly about the Music Together program that she wrote an article for the Buckner Villas newspaper, encouraging her fellow residents to attend so they too can experience the joys of music that she feels with the children. I see it in Marge who belongs to five choirs, loves to sing with us, especially when we do part singing, and who occasionally will dance along, too. I see it in ninety “something” year old Lillian, who arrives every Thursday with her ornately decorated walker (right now with autumn leaves to celebrate the season), and in Joyce, who loves to sing along, share songs of her past, and shout out her favorite animal when I ask for suggestions. This shared joy resounds in Inga, a beautiful Swedish woman who fights her instincts to want the children to remain in the circle because that was the way she was raised, yet she totally understands when I explain to her that some children need to move around to be able to learn in their own way. All of the residents cherish the ritual at the end of class when the children come around to shake their hands. There is Janet, the effervescent activity director, who always attends class whenever possible, simply because she loves to witness the children and their ability to constantly learn and change. Janet is forever thinking up new ways to give something to the children, and is already playing with an idea for Christmas. And Kenneth, another employee of Buckner Villas, occasionally pops by to take pictures at the beginning of class and then scurries away to print them in time to give to the young moms so they have their mementos when they leave. I would be remiss not to mention the wonderful parents of these beautiful children, too. These devoted moms and dads try to get to class early so that they can visit with the residents and they always hang around afterwards to check in with each other, creating a strong support group. They delight in watching all the children grow and encourage them in small ways. One of the moms shared with me that her family has a drum set in their living room so that their son can understand how important music is to their family. They believe that the drums shouldn’t be hidden away in his bedroom for only his enjoyment! That is true love! 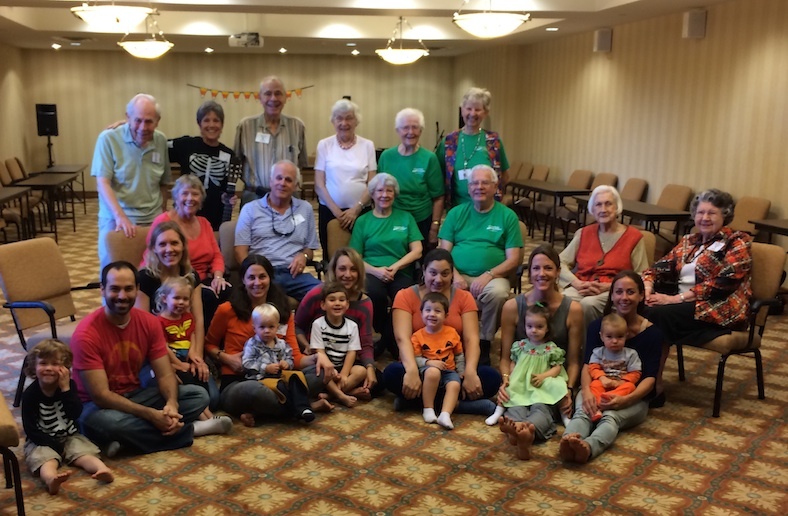 If you have never visited an Intergenerational class, please come see us at Buckner Villas or join us at one of our other Intergenerational classes in Austin. We will be offering free demos in December and you can sign up online at www.HeartsongMusic.net or call (512) 371-9506. Bring a friend, too! Our 9-week Winter Session starts January 6th and goes through March 8th, 2014. The sounds of music are definitely reverberating at Buckner Villas. It is a beautiful experience of generations coming together to sing and love one another.